Thanksgiving is almost here! I hope you are able to spend time with your family and loved ones this season, and are excited to dig into that glorious meal! But if you are having any worries that the holiday can destroy your diet, here are some tips to keep in mind and leave you guilt free and full of gratitude. Turkey Trot! Get moving first thing in the morning, before any kitchen duties and obligations get in the way! Many cities host a “Turkey Trot” or short run/5K that you can bring the family along, especially fun if you’re hosting out of town guests! Don’t restrict eating throughout the day to “save up” for dinner. This will only make you hungrier and more likely to overeat. Have something light but substantial like a protein smoothie. Hydrate! Start ramping up your water intake the day before. This will regulate your hunger hormones. Keep drinking throughout the day, especially after dinner to flush out all the salt and help with bloating. Sparkling water is good too, even as an alcohol replacement! I love sipping hot water after my meal to soothe my full tummy. Have a game plan! Ask the host ahead of time what’s on the menu, then you can be mentally prepared for what you do and don’t want to eat. Offer to bring a dish that fits your lifestyle! Try to have an early dinner! If you’re hosting, serving dinner early will help resist filling up on appetizers, and then you have more time to digest your meal. Maybe you can even squeeze in an after dinner walk or toss the ball with the kids! A tip I love for dinner is – choose 1 – either drinks, bread, or dessert, not all 3. I know this is hard on Thanksgiving, but something to keep in mind! Veggies first! Usually the leafy salad takes up so much room on my plate, then I’m able to portion control the more indulgent side dishes. Don’t forget turkey is a great source of lean protein, eat up! Healthy swaps! 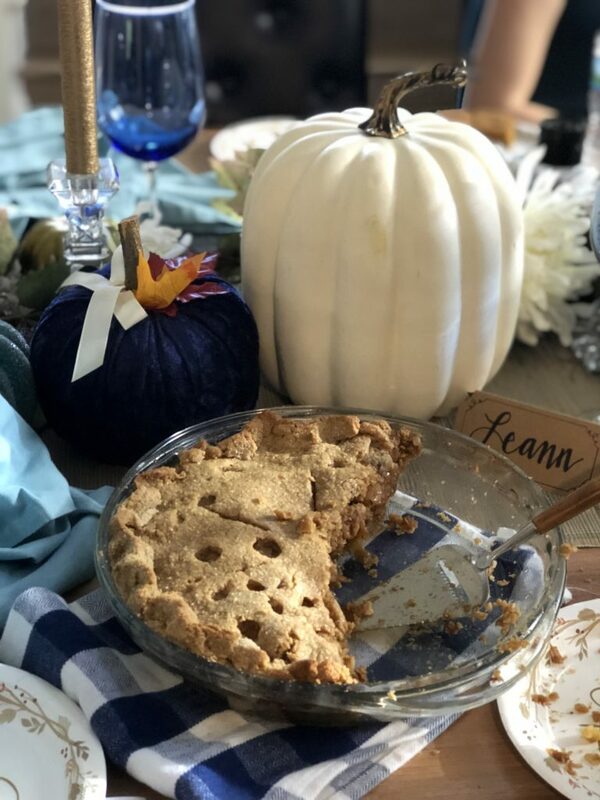 For my annual “Friendsgiving”, I made an incredible apple pie, using almond flour instead of white flour crust, and coconut sugar instead of white sugar. No one could even tell the difference! Plan an activity! Having something else to focus on besides food will help distract you from mindlessly eating. This year I have a cardboard wreathe, and I’ll pass out paper leaves for everyone to write down what they are grateful for. Then we arrange the leaves on the wreathe, tape them on and display for everyone to see! Be grateful! Try not to stress and remember the reason for this holiday. Enjoy every conversation, sip and bite! Cheers!